I heard once that there are more flintknappers today than there ever were at any other time in history. In other words, today's population is so big, and people have so much free time, that there are now more people who know how to knap flint, most of them as a hobby, than there were people who had to shape flint to survive at any time in human history. That's one of those rumors that's too good to check, but there's a grain of truth in it. Every historical activity and profession, even those least necessary in today's society, has its scholars and enthusiasts. Today, you can get a sword blacksmithed by hand, in a historical design and made by historical techniques, and you can order it over the Internet. Which is useful, if you're one of those people working to recreate the martial arts of the Middle Ages. 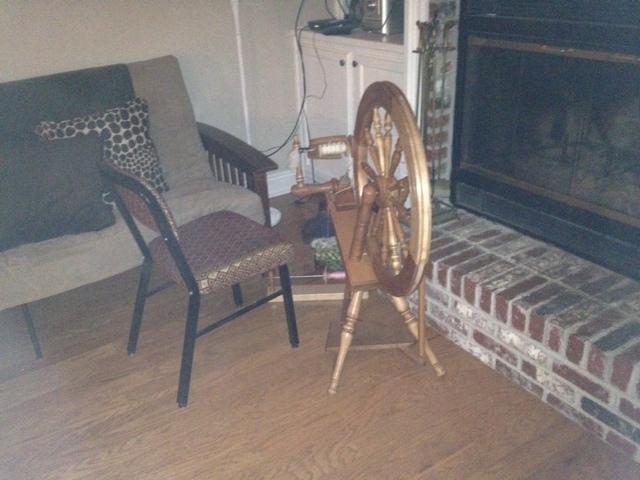 I bring this up because my mother has taken up spinning recently. 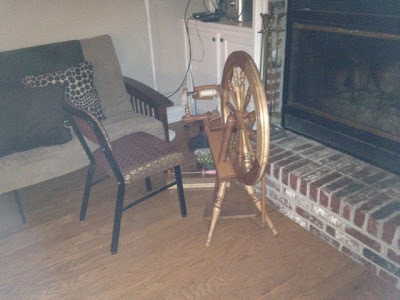 That includes everything from raising the animals to using an actual, old-fashioned spinning wheel to spin the hair into thread and yarn. 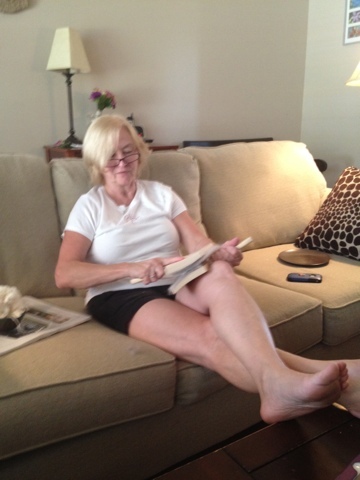 When we were visiting her in Louisiana, she showed us some of what was involved. 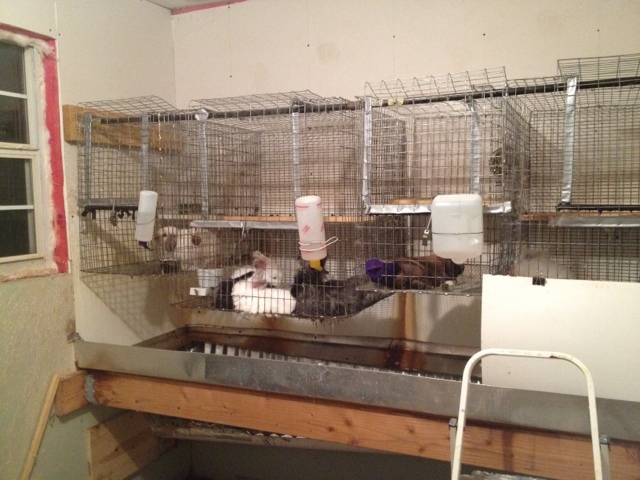 Angora rabbits in their hutch. 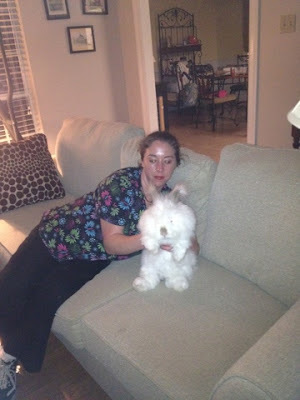 Mr. Bojangles, the patriarch, so to speak, held by my sister Sarah. She'll spin more than just rabbit fur, but the angoras are the only one she's trying to raise herself. Unlike sheep, who are sheared, angora fur is removed by brushing the rabbits. You can use just your fingers when they're really shedding. The fur needs to be carded, which aligns and cleans the fur, as I understand it. After that, it can be spun. 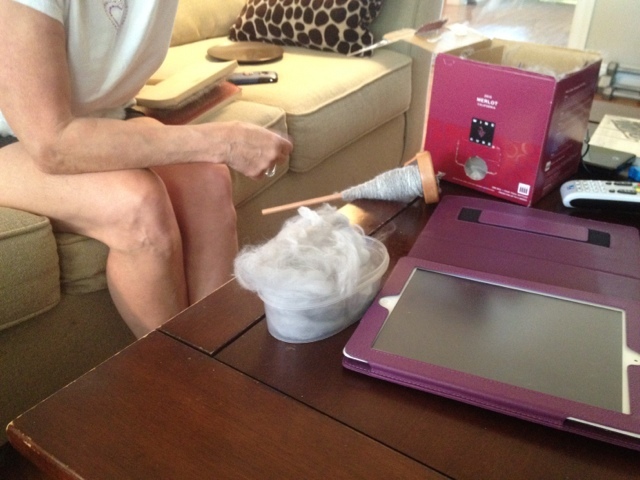 I didn't get a picture of my mother using the spinning wheel, although you can see her with a spindle here. My mother with a spindle. Thanks. I like this article about my hobby.